Happy Great-teen everyone! I’m not sure about you guys but I have had a bananas fun and crazy start to 2018 – a new job, a new house and finally getting out of my walking cast to become the queen of physiotherapy. Yay! And what better way to celebrate 20-greateen then with a shiny new pair of jeans! These bad boys are the Safran Jeans (aka Safran Pants) by my old favourite Deer and Doe. The Safrans are high waisted skinny jeans with ace welt pockets and come in two styles. Version A has back pockets and belt loops, and Version B is pared down with a cropped ankle length and no loops/pockets. I wanted to go for a more traditional jeans vibe so went with Version A. This lady loves a belt loop! Before beginning these I read a bunch of reviews that stressed the importance of having both shell and lining fabric with stretch and after constructing these I have to concur. 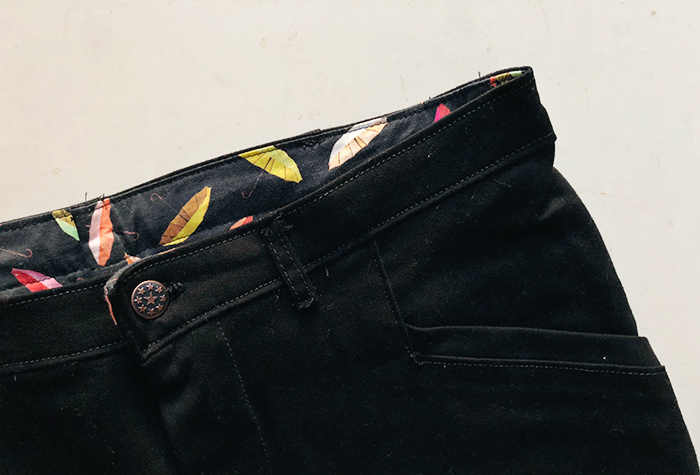 In the end I went with a black stretch denim from The Fabric Store for the shell and a super cute umbrella print stretch cotton from Tessuti Fabric for the lining. Because grown up lady types deserve epic umbrella lining! Construction wise I would rate these as intermediate but accessible to a beginner with google, patience and time. I had fun constructing the angled welt pockets and totally did a happy dance when I finally got them working. As always the Deer and Doe booklet was well illustrated and I found it easy to follow but I did play around with the construction order a bit and follow some of the steps outlined in the Closet Case Patterns Ginger Jeans as this was familiar to me. Real talk – I had some issues with fitting these. In hindsight I should have gone a size down and graded up for the hips as I had to take the waist and side seams in significantly. The main issue is the same one I faced when making the Ginger Jeans with weird fabric folds and drag lines starting mid thigh and continuing down. In the end I took a bunch of fabric off the side and made these a wearable muslin which I dub a success. Since then I have ordered Pants for Real People and also signed up for a pants drafting course. This lady had so much fun making jeans she is not going to let something silly like drag lines slow her down! The ace welt pockets. I feel like these level these up from jeans to jeans pants. Jants? Is that a word? I think it is now! The waistline. I like where it sits on me – it’s like a hug for my stomach! Solve those weird fabric folds. I am totally going to Sherlock Holmes those suckers! Potentially try a size down and grade those hips up. Overall, I really dig the concept of these jeans and I’ll be wearing these around the house. I’m totally smitten with the welt pockets for the Safran’s and am keen to get back into the saddle armed with the pants fitting guide book to get these to where I want them. Just you wait – twenty-greaten is going to result in some epic jeans pants JANTS! Your jants are fab – the fit is great! I have this pattern but have yet to make it up. Great-teen is my year for pants and I have this Palmer/Pletsch book on its way to me too! I think your pants fit pretty great – just think if they were RTW, you would think they fit amazing 🙂 I think it would be a shame to just wear them around the house. Look at us being pants making twins! We are totes going to own twenty-greateen! I think you may have too much length between your thighs and your calves. That’s easy to check for, just pin some pleats and see if that helps. Or the pants are getting caught on your calves. If you open up a side seams in that area does it open up and solve the problem? Then do a wide calf adjustment. LLadybird showed how she did one once. Hello! I have done the calf slice issue and that helped a little – I think there may be knock knees as well. I also have one full side thigh thanks to too many years of roller derby. Gah! The length idea is great 0- thank you for the suggestion! I love them! Personally I think you should go British and say je-owsers! How can a lady not feel sassy in a pair of jants?! I think I need to wear only stretch clothes from now on out!